1 What is Sieve filtering? At a basic level, Sieve is a system whereby the server is given rules by you to filter your email into folders. It then means that, whatever email program you use, your email is already filed away in to their correct folder according to your needs. Sieve can do more than just move email into folders. TLS You should use TLS for a secure connection, required. 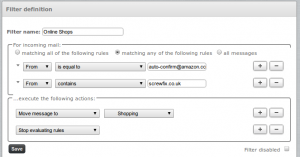 RoundCube - our webmail has a Filters option in the settings - We'd recommend this even if you don't usually use webmail. Extension for Thunderbird (fine for manually editing the script file) Important note: Use the latest version (e.g. version 0.3 or higher) as the one on the Thunderbird Addons website is old and does not work. There are others, take a look at sieve.info. You'd use the same server, username and password that you do to access your email, and use port 4190, and TLS. Whatever IMAP email program you use the Sieve filtering will still work. It may be easiest to create and edit the filters using Roundcube webmail even if you don't wish to use Roundcube for reading email. Roundcube will let you create filters using a WYSIWYG style editor - with easy to use drop-down options and so on. You can't edit the sieve code in 'raw' format though - but for most people, using Roundcube is probably the easiest way. This will then move emails from these addresses in to a separate folder. When using fileinto: with :create, a new folder will be created if it does not already exist, this is normal. In this case, the new folder will be subscribed to automatically. -You may need to restart your client (e.g. Thunderbird) for it to notice that there is a new folder that should be listed. This file will be found in your 'Local directory', which can be found in Account Settings - Server Setting - look for the 'Local directory' box at the bottom. Check that there are not any errors reported, then click Save. Click the little Active button so that it turns in to a green tick. Either by closing Thunderbird and renaming the msgFilterRules.dat to something else (e.g. msgFilterRules.dat.old) or by unticking all the tick boxes under Tools - Message Filters. You can then view the filters via Roundcube webmail, which is easier to edit as it's more of a GUI editor rather than than a straight script editor like the Thuinderbird addon is. This page was last modified on 15 February 2019, at 11:02.